I love my Franklin Covey A5 Planner, however it's not the smallest of planners. So sometimes transportation can be an issue. Any passionate planner addict knows that your planner goes with you pretty much everywhere. During my working week it comes with me in my work bag and that's all good. Come the weekend I ditch my work bag and use my weekender or shopper, which are a lot smaller. 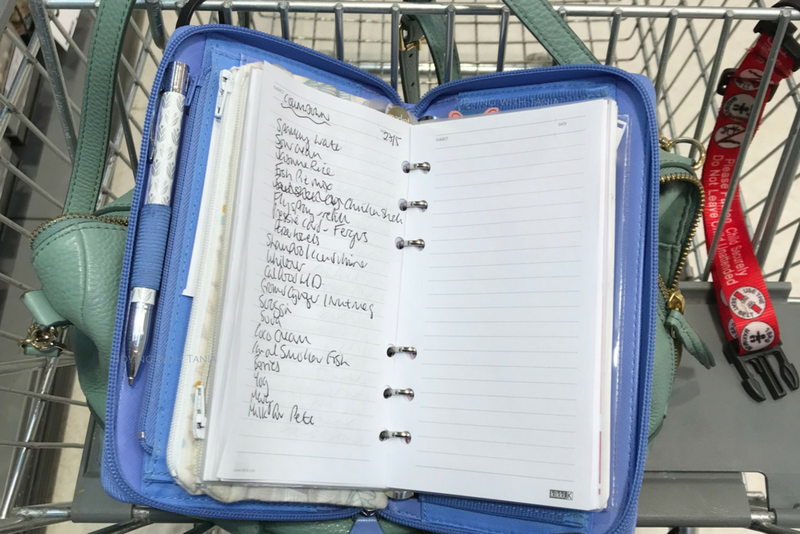 Most of our weekends, at the moment, are spent at the Bunnings/Mitre 10 (Hardware store), so taking a A5 planner with me is not really practical. Added to this is my somewhat endless frustration of hunting for the pen and lists in my bag.....yep I can't always be perfectly organised. When we are out and about in the weekends, I normally only have my keys, wallet, pen and lists...never ending list of dam chores!, which are normally in a notebook. I would find myself carrying the notebook , wallet , phone, pen and keys. Now just to be clear, I do also use notes on my phone, but actually find it easier with a notebook, yep I`m a bit old school! The other challenge is that we are cash based, which means that we use cash. (it's a very effective way to stay on budget, check out Dave Ramsey method if you want to know more). I thought ok there must be a better way to "carry" all this stuff, especially in the weekends. Ideally what I wanted was a wallet that could actually house everything, so all I needed when I went out was my wallet and keys. While thinking about solutions, I struck on the idea of a planner wallet. Well you guessed it, it turns out that it is a real thing. I got onto Pinterest and You tube and uncovered a treasure trove of "planner wallets" or "on the go planners". In my many hours of research I worked out that planner wallets were actually planners that were being used as wallets. These were normally pocket sized planners (the really tiny planners). The on the go planners were actual wallets that had planners in them, yep they are different. The pocket planners, like this Filofax leather Malden, very cute, are popular as wallets. However this was not really going to work for me because I needed to house my cash envelopes, and in reality I didn't need an actual planner as such more a "notebook"
It might seem a bit silly listing out these requirements, but I find it really helpful when trying to decide on the best options when there is a lot of choice. So if you are ever overwhelmed by too much choice, try making a list of your needs , it might help. Now that I got my requirements sorted, I was fairly quickly able to identify the best choice for me......drum roll please! The Filofax Saffiano compact organiser was the perfect solution, ticked off all my requirements. Best of all I could get it in my favourite colour, which we know is the most important thing of all. So Amazon took my money and I waited. Finally the Amazon box arrived and I "unboxed it" no I didn't do an unboxing video! not really that exciting.! Now came the fun part, the set up. There is just the right amount of card slots for my money cards, loyality cards etc ( I had already sussed that out when I ordered it). The zipped pocket is where I hold our weekly grocery and coffee cash and the compartment in front holds all the receipts. On this side I have my four most used cards, Visa Debit, One card (petrol and supermarket), Life Pharmacy and Fly Buys reward cards. The other side has four different store reward cards, just the main ones I tend to use. The front compartment has my coffee and dry cleaning cards. So the "wallet" part of the Saffiano was perfect. The "planner" part is actually a removable ring planner and many people just remove it put in a note book. I kept the "planner" in but changed the set up to suit me and how I wanted to use it. notes - mainly a place to capture any ideas/thoughts/solutions on things as I am out and about. mainly measurements for the visits to Bunnings/Mitre10. Calendar - monthly view only of the remaining part of 2018. I took some existing ruled note pages, personal sized, that I had in my existing planner supplies as the inserts and made up my own dividers. I made the dividers out of card stock, cut them to size and laminated them. I used Sunday Morning from Craft Smith as I thought it was the perfect theme for this weekend "on the go planner", and the colours matched perfectly. My phone slots nicely into the side pocket on the outside of the wallet so I don't need to open it to get to my phone. The final test was ensuring that the cash envelopes fitted perfectly, which they did and boom I had my perfect "on the go planner"
It's been a great purchase and the perfect solution to my frustrations. The best thing and what I love most is having the shopping list's all in one, it's so good when doing the shopping with a list. If you want to see other ideas for planner wallets, just check out my Pinterest Planners board . So how is your wallet set up? Is it working for you?, Do you use a planner in your wallet? Leave a comment below as I`d love to hear from you. Want to see more photos and stories from me? Of course you do!